This study was conducted by John Rosenblum, PhD. He concluded that replacing the hydropower facility with 3 acres of solar panels would increase energy generation. Dr. Rosenblum also noted that hydropower is extremely variable, and that output is often at zero in winter when solar output would also be low. Given that the Potter Valley Project is operated to divert water out of the watershed, energy generation is highest in the summer (when irrigation needs are highest) and could easily be replaced by solar PV. This study was conducted by Dr. Alison O'Dowd and Dr. William Trush, co-directors of Humboldt State University's River Institute. This study was conducted by Eli Asarian of Riverbend Sciences on behalf of Friends of the Eel River in 2015. This report was prepared by the Center for Environmental Economic Development (CEED) on behalf of Friends of the Eel River in 2002. This report was prepared by the Center for Environmental Economic Development (CEED) on behalf of Friends of the Eel River in 2004. 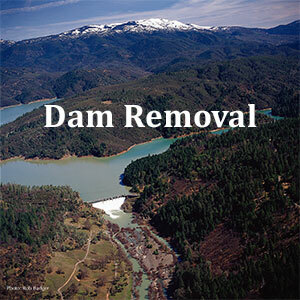 Click here to access dam removal resources on our website. Click here to listen to radio episodes by or including FOER staff, and videos of presentations and good times on the river.